The earliest stone structure on this site dates from the 13th century, possibly earlier. The fortification guarded the anchorage below in the bay, and controlled the land link between Tarbert's East and West Lochs. In 1292, it was certainly a Royal Castle, being among those granted to John Balliol by Edward I of England. In 1325, Robert the Bruce enlarged and fortified the Castle, with the extensive curtain wall and drum towers enclosing almost two acres. Surviving building accounts record, among other structures, a hall, a chapel, houses, workshops, a brewhouse and, outside the wall, a mill and mill lade. The Tarbert Castle accounts which were prepared for Robert the Bruce are some of the oldest documents in the Exchequer Rolls of Scotland. Below is a partial translation, the original having been written in Latin. ROBERT THE BRUCE HELD IN THE EXCHEQUER ROLLS FOR SCOTLAND. 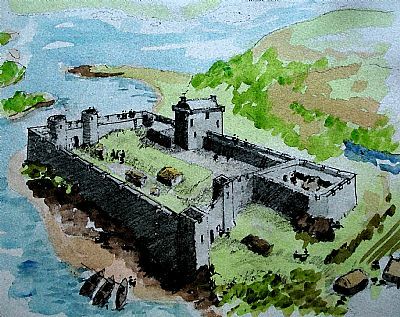 In 1494, James IV, requiring a strong base for his operations in the Western Isles, repaired the Castle and built the Tower House. He brought artillery, victualled and garrisoned the Castle, and summoned Parliament to meet in Tarbert. The Castle continued its royal connections, but, by the beginning of the 18th century, was a ruin. In 1705, the McAlister family of Tarbert tenanted the Castle under charter from the Campbells, but, in 1760, the Castle fell into disrepair, leading to most of the useful stone being robbed to build the village and the harbour. In recent times, supported by Historic Scotland and the Scottish Government, the ruins have been stabilised and the site opened up for public access by local volunteers.